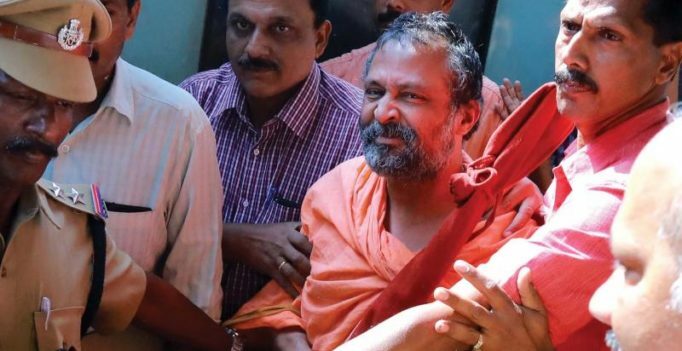 Kochi: Central Bureau of Investigation sleuths produced Swami Raghavendra Thirtha, former deputy pontiff of Kashi Math Samsthan, before the Chief Judicial Magistrate Court in Ernakulam on Tuesday. A large number of the followers of the Swami assembled at the Ernakulam North Railway Station and the court complex to have a glimpse of him. The CJM court had issued a warrant to the CBI probing the case of his missing to produce him. He was brought to Kochi from Chittoor in Andhra Pradesh. He was subjected to a medical examination soon after the arrival before taken to court. The Swami seated in the witness box confirmed before the CJM that he was the same person whom the CBI was searching. He also confirmed his date and place of birth. He told the judge that he was away from Ernakulam as part of a religious mission. The court concluded the proceedings after the recording of his statement. The Swami was taken back to Andhra Pradesh later. He is in judicial custody there for the past two weeks after a police team took him into custody in connection with cases filed against him. Sources close to him said he would file a bail application at a court in Tirupathi soon. The Kerala High Court has entrusted the CBI to trace the Swami in a June 2015 order following complaints that he was missing for many years. Over 1,000 devotees arrived at Ernakulam Station as Sabari Express reached there around 3 pm. Police struggled hard to control the crowd as they took him out. The devotees followed him onto the court premises, and some even entered the courtroom. The Swami waved at his devotees as he came out of the court after the completion of the proceedings. They raised slogans in his support.